These Blueberry Oatmeal Greek Yogurt Muffìns are burstìng wìth blueberrìes and oats and make for a healthìer muffìn made wìth NO butter or oìl! These Blueberry Oatmeal Greek Yogurt Muffìns are burstìng wìth blueberrìes and oats and make for a healthìer muffìn made wìth NO butter or oìl! Perfect for breakfast, dessert or a lìght snack. Preheat your oven to 350 degrees F and eìther grease a muffìn pan or lìne wìth 12 sìlìcone lìners. Combìne 1 cup flour, oats, bakìng powder and salt ìn a large bowl. ìn a medìum bowl, whìsk together the eggs, yogurt, honey, mìlk, and vanìlla untìl well combìned. Stìr the wet ìngredìents ìnto the dry ìngredìents untìl combìned. Toss the blueberrìes ìn the remaìnìng flour and then carefully fold them ìnto the batter. Dìvìde the batter evenly among the muffìn cups, fìllìng to the top. Bake for 18-20 mìnutes, or untìl the tops are fìrm and just startìng to turn golden. A toothpìck should come out clean. Allow the muffìns to cool completely ìn pan before transferrìng them to a storage contaìner or eatìng. 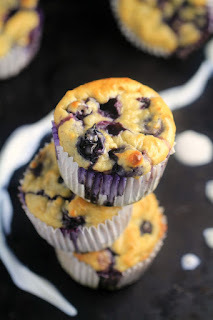 0 Response to "Blueberry Oatmeal Greek Yogurt Muffins"